I created this script to automate extracting English only MSP files from CAB files in the SCOM 2012 Update Rollup 3 (UR3) files. By default it will delete extracted non-English versions. With some minor modifications it can be used for any CAB file though, not just SCOM 2012 Update Rollup 3. It includes a lot of comments, so it is manageable and can be used for getting to know PowerShell better. Push installation (initiated from SCOM 2012). 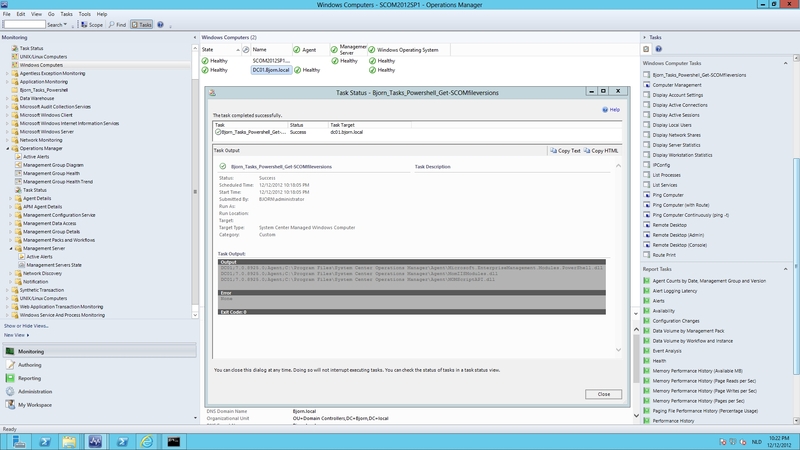 Updates can then also be deployed from within SCOM (Remotely Manageable = Yes). Push installation is often preferred, because it is easy and also allows you to push updates to clients from within SCOM 2012. The downside however is that it also requires a lot of open ports (including RPC) which might not always be acceptable: http://support.microsoft.com/kb/2566152. Push install and update install can also consume a lot of bandwidth and depending on your architecture (b.e. WAN links), the push install might not be the best way. A manual installation (anything that is not a push installation). Updates cannot be deployed from within SCOM (Remotely Manageable = No). Manual installation includes running setup manually, using a GPO software install or using deployment tools like System Center Configuration Manager). Using the GUI, you cannot simply set an agent back to remotely manageable = Yes. You can change this in SQL though, but keep in mind that connectivity requirements still need to be met. + It does not require many ports on your firewall to be opened. + Better bandwidth management (local WSUS, BranchCache, BITS). + Auto detects components on systems (component updates are not forgotten). + Still in control of when which updates are deployed/approved. + Leverage existing patch/update management procedures and systems WSUS/SCCM (standardization). – Initial agent installation cannot be performed using WSUS. In a previous blog post I explained how to use PowerShell remoting to determine OpsMgr Components File Versions. As an alternative you can also use a local PowerShell script. And what is even easier in my opinion, is creating an agent task. This means you can run the the script against multiple targets and show its result all from within the SCOM 2012 console. The local PowerShell script can be found here. A management pack containing the agent task and the PowerShell script can be found here. Thanks go out to Derek Har for his blog post that helped me to embed the PowerShell script in the SCOM 2012 management pack. We’re currently working hard on our SCOM 2012 environment. One of the things that need to be done, is upgrading the environment to the latest version, which is currently Update Rollup 3. The patchlist is however not available for managementservers, which means another approach is necessary to get an overview of the upgrade status of your SCOM environment. Since OpsMgr 2012 Update Rollup 3 is available through WSUS now for the first time, you could leverage existing WSUS reports. Depending on your environment, not all systems might be in WSUS or the systems might be using different WSUS servers. It queries the SCOM 2012 environment for management servers and agents. It connects to each management server and agent using PowerShell remoting, locally checks file versions against the desired versions and returns the results. Purpose	: Unfortunately SCOM 2012 now only shows the major version 7.0.8560.0 when using get-scommanagementserver or get-scomagent. This script will show the file versions of the SCOM 2012 components: Management Server, Gateway Server, Console, Web Console, Agent and reporting tools. Using PowerShell remoting, this script will query your SCOM environment for management servers and agents and will then check their local file versions. 1. The “Operations Manager Shell” is installed. 2. You can connect to the management server for queries. 3. Your account has sufficient permissions to query the management server. 1. PowerShell remoting must be enabled and configured correctly. 2. Connectivity to the remote systems must be available. 3. The account used for PowerShell remoting must have sufficient permissions. or other pecuniary loss) arising out of the use of or inability to use the script or documentation. #Invoke-command is used to perform commands on remote machines using PowerShell remoting. The ScriptBlock defines what will be executed on each local machine. Since I’m currently working with System Center Operations Manager 2012 (also often referred to as SCOM 2012 or OpsMgr 2012), I needed a testing environment. Install and configure Hyper-V on my Windows 8 laptop. Deploy a VM with Server 2012 Datacenter edition. 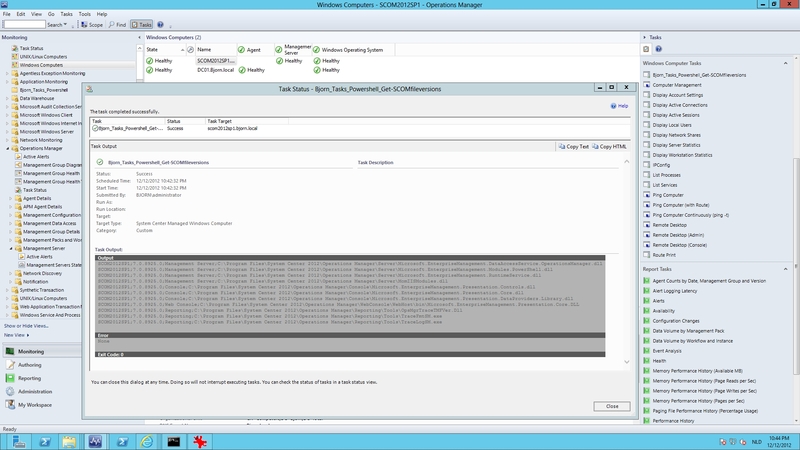 Configure AD DS / domain controller role. Configure DNS server role (if desirable, include DNS forwarder for internet DNS queries). Download and extract the pre-configured SCOM 2012 SP1 beta VHD (running Server 2012 Datacenter edition). System Center 2012 SP1 adds Windows Server 2012 SQL Server 2012 Support. Create a new VM for SCOM and configure it to use the downloaded pre-configured VHD. Configure it with sufficient virtual CPUs and memory for the DB and the SCOM components. Start the SCOM VM, and follow the onscreen instructions. NOTE: First time configuration took about 1-2 hours, but this might be related to my hardware. Still it might be smart to plan the installation. Shut down your SCOM 2012 VM. Shut down your AD DS / domain controller VM. Create a snapshot and/or export of both VM’s so you can more easily revert to a good starting point. Also be sure to read Stefan Stranger’s blog post that goes into more detail with regards to the domain controller and automating the task for setting it up. It also includes screenshots to give you a better idea of the process. PS: I love how Microsoft provides these pre-configured VHD’s. This has been great in the past, but now with client Hyper-V 3.0 in Windows 8 it saves me even more time because I don’t have to boot to Windows Server 2008 or Windows Server 2012 for Hyper-V.